We offer a wide selection of bagged and bulk wild bird food including mixed seed and straight seed. Bagged bird food ranges from 5lbs to 50lbs. Bulk bird food is available by the pound. 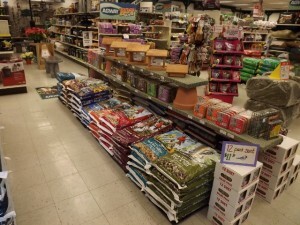 We proudly carry quality brands such as Feathered Friend, Wild Delight, Birdwatcher’s Best, Agway, and Blue Seal. Advanced bird seed orders are available each fall to help you stock up for winter and save money. We also participate in the Feathered Friend bird seed club. In addition to wild bird food, we offer domestic bird food brands such as Kaytee.